Even Albert Einstein wondered why mathematics works so well in science and how is it possible that mathematics can offer such a good description of our visible universe. 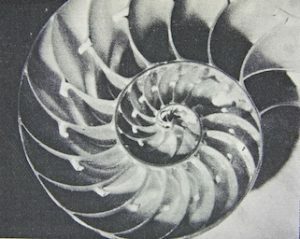 The spiraling swirl of a nautilus shell resembles the spiral shaped form of the galaxies. What significance does this have? It seems that everything which physically exists can be described by numbers and equations. The number of petals of a flower follows the same principle as the number of seeds in the head of a sunflower, as the underside of a pine cone or the ideal proportions of a human face. named after the 13th century Italian mathematician who discovered that certain numbers occur particularly frequently in nature. In mathematical terms it goes like this: you begin the sequence with the simplest integers: 1+1= 2 and then keep on adding the last two integers so you get 1+2=3, 2+3=5, 3+5=8, 5+8=13, 8+13=21, 13+21=34 and so on. A puzzle? Sure, to some extent. But a puzzle that makes sense. Could it be that we’re in the middle of some gigantic universal game? OUBEY – who could work his way easily through even the most complex and daunting mathematics – really relished this idea. It’s the same with the famous number Pi. Everyone knows it but who knows what it really means? It tells us which colors appear in the rainbow and what the note C on a piano should sound like. And in antiquity Pythagoras, whose theorem most of us know and many of us could even quote, explored the relationship between mathematics and music: octaves, fifths and fourths are determined by the different length ratios of vibrating strings. These are expressible mathematically – 2:1 for the octave, 3:2 for the fifth and 4:3 for the fourth. And the planets too in their orbit round the sun also follow fixed numerical ratios. 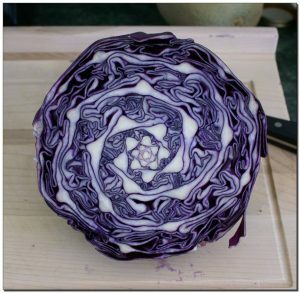 It seems obvious that certain numerical ratios create balance and harmony. Are they the expression of a hidden order in nature that – it could well be – ultimately consists of numbers? “The Universe is written in the language of mathematics” Galileo once said. And it seems he was right. 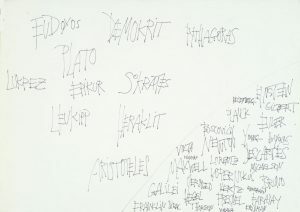 Galilei also appears in OUBEYs drawing below from the early 1980s, where he spontaneously jotted down the names of all the researchers, scientists and philosophers whose thoughts, discoveries, inventions and predictions he held to be fundamental in building an understanding of the nature of our existence. From Pythagoras and Plato over Galileo, Newton, Leibniz and Einstein through to the countless numbers of researchers and scientists of our own time, we are endowed with a growing fund of knowledge and discovery fixed in consistent numbers, calculations, equations and conclusions in the shape of formula and principles on whose basis scientists can now land a robot vehicle the size of a car on Mars or a Rosetta Space Probe on a comet – far off in the depths of space, remote-controlled from Earth. One of the fascinating things about mathematics is that it can make the most impossible predictions which prove to be true the moment humans develop the technology capable of substantiating them. 200 years ago, when the planet Uranus deviated from its usual orbit around the Earth, mathematical calculations led to the idea that this deviation must be due to the gravitational influence of another planet – an undiscovered planet that had never been sighted. Neptune was discovered by pure mathematics long before we could see it. 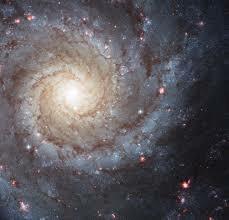 There was a similar case with Peter Higgs, who more than 50 years ago used mathematical calculus to predict that an entirely new subatomic particle – an elementary building block of the Universe – would be discovered as soon as humans were capable of constructing a machine in which subatomic particles could collide at near the speed of light. Three years ago the gigantic particle accelerator CERN near Geneva succeeded in doing precisely that. The new particle bears Higgs´ name and the man himself was awarded the Nobel Prize for his discovery. And just recently mathematical calculations were used to “predict” the existence of a new planet in our solar system. It’s only a matter of time before this latest prediction from mathematics will becomes visible to us. This can last more than 100 years as we know since the gravitational waves which Einstein stated to exist in 1915 as part of his theory of relativity, have been detected by the LIGO project only this year – presented to the public on 12 February 2016. 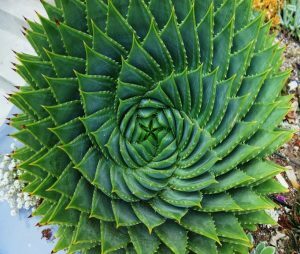 “Is mathematics a natural truth or has it something to do with the way we humans perceive nature? For me, it’s simply a fascinating puzzle. I don’t know the answer“, asked Andrew Lankford from the University of California in a statement he gave deep in the LHD tunnel at CERN. That’s pretty much my feeling too. How wonderful it would have been if only a single math teacher had put just one of these questions just once to us in the classroom instead of continually trying to stuff our heads with incomprehensible mathematical formulae. My brain cells at least would have perked up, and instantly switched to high attention mode. My curiosity would have been aroused and all those years ago I might even have had a faint inkling of what mathematics is actually all about or what it could be. After all, you don’t’ have to understand or master everything, but you do need to have some idea of the significance of what you don’t understand or master. This makes the memory of a winter night in 1983 all the more fonder, when OUBEY explained to me the principles and meaning of vector calculus. It was the very first time in my life that I took any interest in mathematics. Immer wieder wurde ich in den letzten Jahren gefragt, wann und wo es denn endlich auch mal OUBEYs Bilder im Original zu sehen gibt. Das wird nun im Rahmen einer Tour möglich sein, die im Oktober starten soll. Sie wird im Laufe der nächsten Jahre an verschiedenen Orten in verschiedenen Ländern dieser Welt Station machen.